Tofu is made from pressed, whole soybeans (you can learn more about soy here), and as per the 2017 Guidelines for the Diagnosis and Management of Food Allergy, soybeans are a common food allergen that is important to introduce to infants around 6 months of age. Early introduction may help to reduce the risk of developing food allergies. Tofu is a great first food for baby because it not only provides a source of iron (as well as protein, calcium and zinc), it's also soft and texutre appropriate. Be sure to purchase plain, extra firm tofu for baby so that it doesn't contain added sugar or sodium. These strips are lightly seasoned with whole ingredients, introducing your baby to different flavours too. The sticks are a graspable shape making it easier for baby to pick up and self feed. The strips are soft and suitable for babies without teeth too. 1) Open the package of tofu and cut the loaf in half so that you have two skinnier halves. We're only using one half so you can store the other half in an airtight container in the fridge. 2) Wrap the entire piece of tofu with paper towel and press the water out of it. Let it sit with the paper towel a few minutes. 3) In the meantime, make the marinade in a large, shallow airtight container (or a Ziploc bag). Set aside. 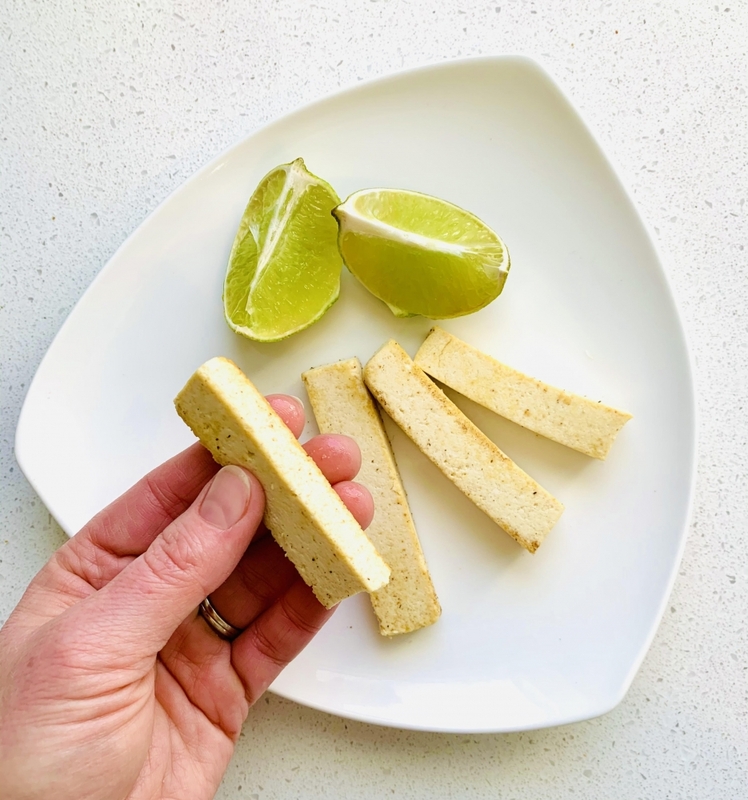 3) Unwrap the tofu and cut the wedge into strips, the width of your pinky finger (you may cut them in half again for a smaller strip). 4) Add the strips to the marinade and shake well until the strips are all coated. Let sit at least 5 minutes. This is a good time to preheat the oven to 400F. 5) Once the oven is ready, place the tofu strips on a lined cookie sheet. Bake at 400F for ~20 minutes (turning them half way). 6) Let cool and serve to baby. Turmeric - How Much do You Really Need for Health Benefits? Food to Fit is a team of registered dietitians with a specialized set of skills and expertise, carefully trained to deliver quality services based on the Mission and Vision of Food to Fit. Food to Fit Nutrition Inc.
© 2019 Food to Fit Nutrition Inc. - All rights reserved. Squareflo.com.